One in five millennials have never had the flagship sandwich. 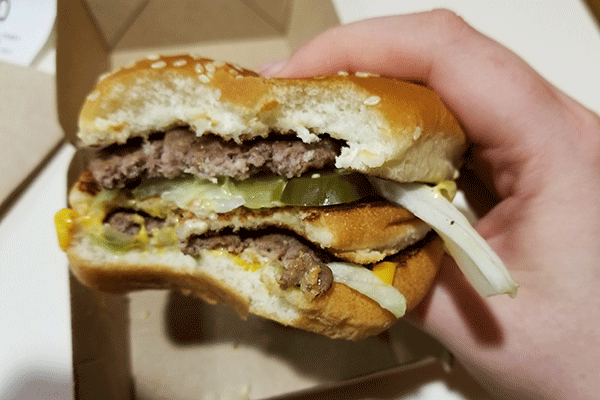 Yes, I was one of the four in five millennials who have never eaten a Big Mac before — until Friday. The iconic McDonald's Corp. (MCD - Get Report) hamburger accounts for about 20% of McDonald's sales, according to Fortune, and millennials, defined by the Pew Research Center as individuals born between 1981 and 1997, are the largest generation at 75.4 million members in the United States. 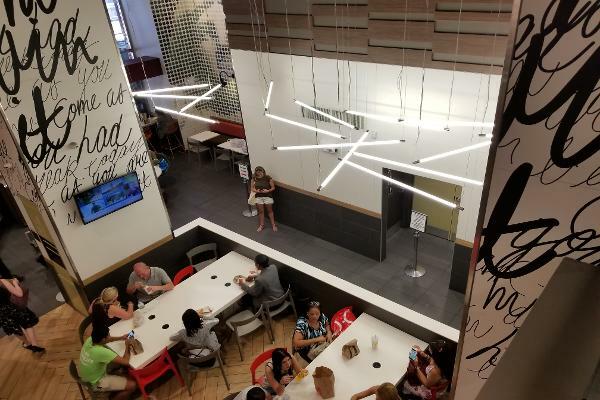 Having lost 500 million customers since 2012, McDonald's USA President Chris Kempczinski told investors in March, the fast food chain has taken initiatives to bring healthier food options and meet millennials through technology to attract them to its stores. On June 12, the Golden Arches introduced "snaplications" as a way to recruit employees ages 16 to 24 on Snap Inc.'s (SNAP - Get Report) app in an effort to fill 250,000 positions this summer. Snapchat users can record a 10-minute video of themselves wearing the augmented-reality McDonald's uniform in the app and send it to McDonald's, which will provide them with a link to the job application that they can fill out within the app. McDonald's is also recruiting through music-streaming service Spotify and video-streaming service Hulu, according to a news release. Additionally, the company has introduced McDelivery through the Uber Technologies Inc.'s UberEATS food delivery app. 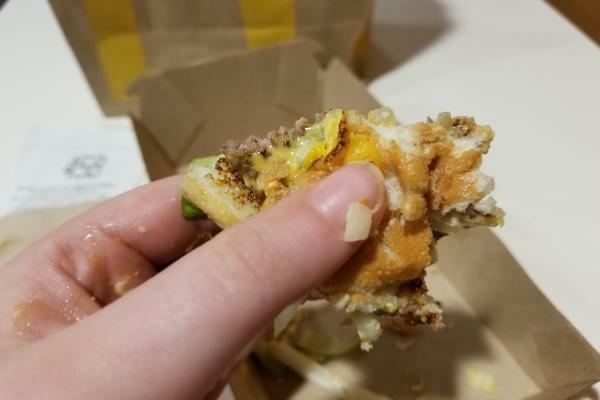 Further, Mickey D's has unveiled new sandwiches that cost $5 to $7 each through its Signature Crafted Recipes line, which uses "authentic ingredients" such as 100% beef patties, artisan grilled chicken, guacamole from real avocados and white cheddar instead of American cheese. 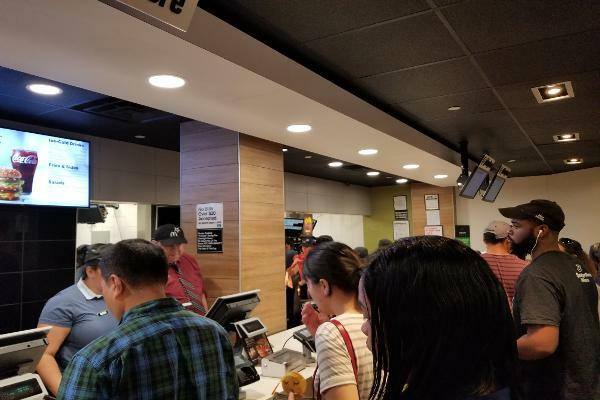 A top McDonald's franchisee wrote to fellow operators in a July 2016 memo that the Big Mac "has gotten less relevant," according to The Wall Street Journal. 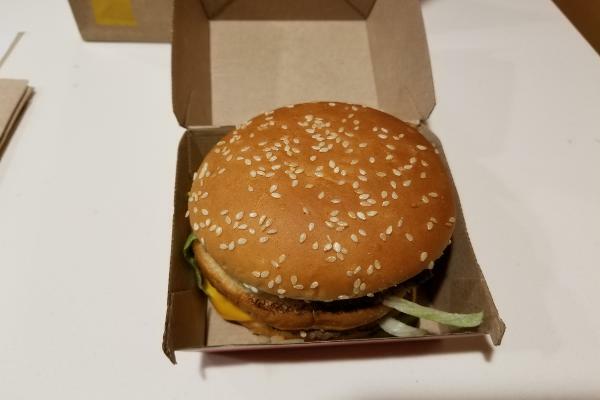 The memo included that about 80% of millennials have never tried a Big Mac. Here was my experience trying the flagship sandwich for the first time. Editors' pick: Originally published August 4. 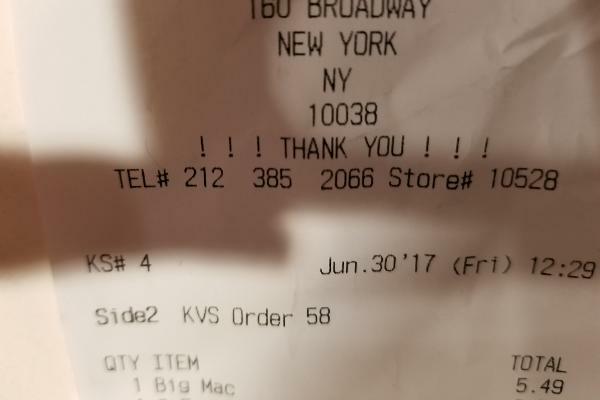 I arrived at the McDonald's at 160 Broadway in Manhattan's financial district in New York City during the lunchtime rush. 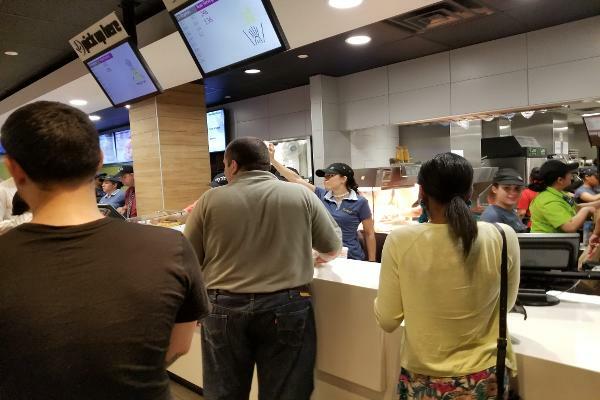 The place was bustling with people, but there were two employees directing patrons to stand in the lines for the six cash registers. It is no more than two minutes before I am up to order. A sandwich for $5.49 is pretty good for NYC, fitting between a $4 falafel pita and a $8 Chipotle Mexican Grill Inc. (CMG - Get Report) burrito. Add a small french fries for $2.29, and the total came out to $8.47, including tax. Despite the restaurant being busy, my order was out within a minute. I got my food before some of the people who were waiting before I was. I head upstairs to find a place to sit, and looking around, this is definitely not a classic McDonald's. Funky lights, lounge seating and casual tunes playing in the background give the place a feeling more like your morning coffee pit stop instead of the fast-food restaurant of yesteryear. With plenty of seating, I easily found a spot to sit. 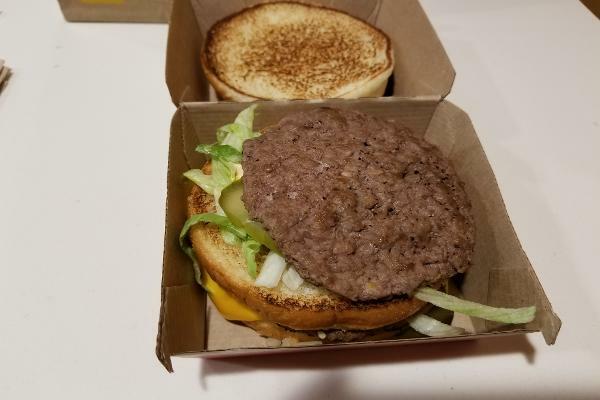 While it is not in a happy meal box, the sandwich presents itself nicely in a cardboard container in the traditional McDonald's fashion. Time to dig in. Opening the box, a toasted brioche bun with sesame seeds shines under the lighting. The sandwich is colorful and tasty-looking. 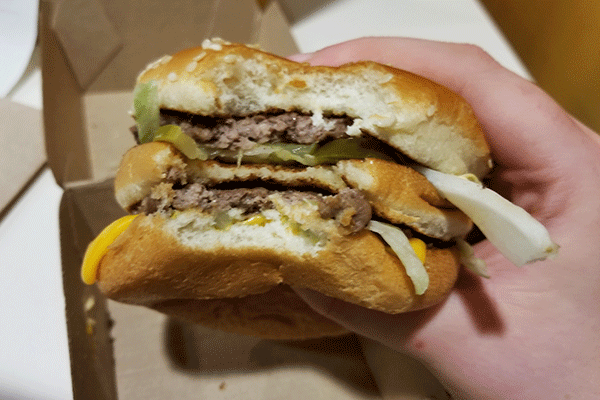 Uncovering the inside, all I can think is that this is one of the smallest and thinnest burger patties that I have ever seen. 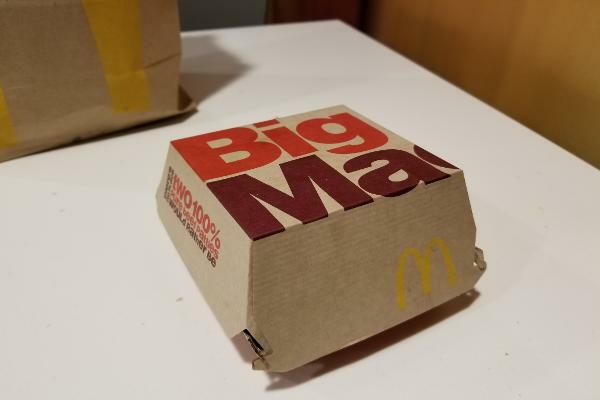 "Big" may be a slight overstatement. 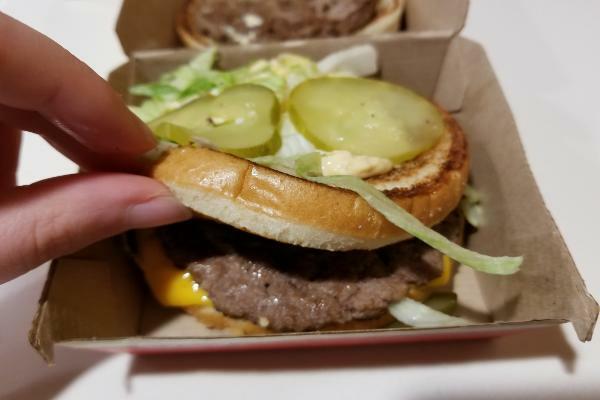 The Big Mac also includes pickles, lettuce and some sort of off-white sauce. 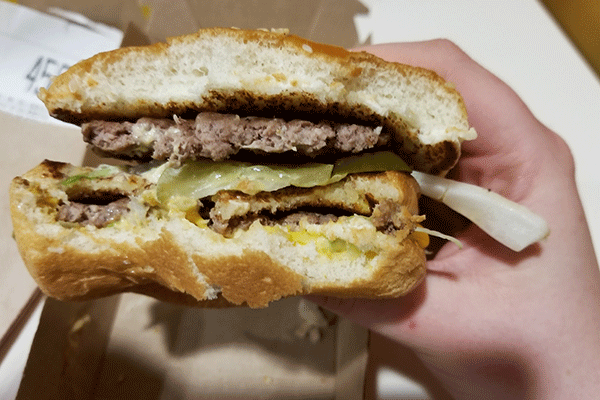 According to McDonald's website, the sauce has flavors like pickle relish, garlic, mustard and more. There is also an extra piece of bread in the middle, which is probably just a way to make the sandwich bigger. In the second half of the sandwich, there is another hamburger patty, which if combined with the patty from above would probably be about the size of a typical hamburger. There is also more lettuce as well as cheese so yellow it reminded me of crime scene tape. Taking the sandwich out of its box, I calculate how I will fit the tall doublestack into my mouth. Just kidding. 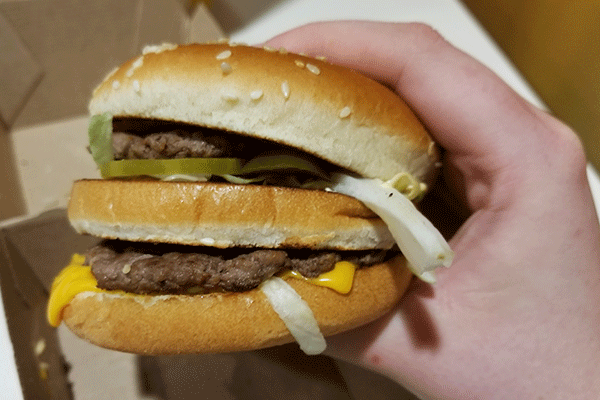 In my first bite of the Big Mac, I mostly tasted the cheese. It was warm and almost liquid like. That's definitely not the type of thing you would find in a Chipotle burrito bowl. In bite No. 2, I got a better taste of the sandwich. I actually thought the overall taste was good. 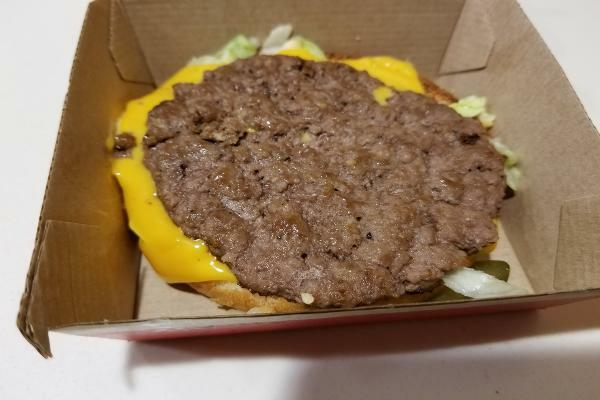 The burger was not greasy, though the meat was dry and a bit tough. On bite three, I bit a little too far off to the side, so I mostly tasted the bread and the sauce, which was a bit overwhelming. I do not like mustard, which, of course, is what I mostly tasted. It, however, had a mix of sweet and zesty flavor, so I could imagine why some people might like it. About halfway through the sandwich, things took a turn for the worst. Lettuce and a pickle fell out of the sandwich, and the sauce was beginning to drip on my hands. 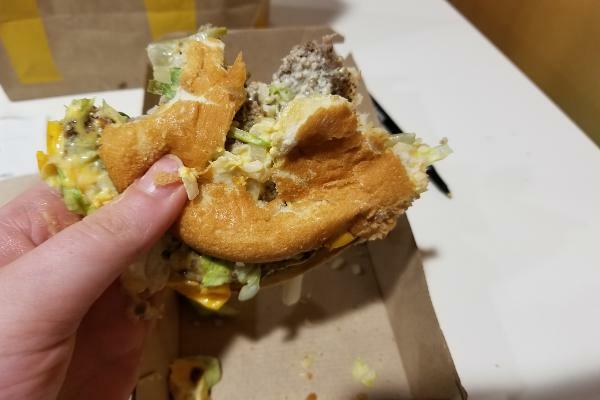 With the final bite of the hamburger, I was full but the saltiness had gotten to me. I was looking forward to taking a swig of water. 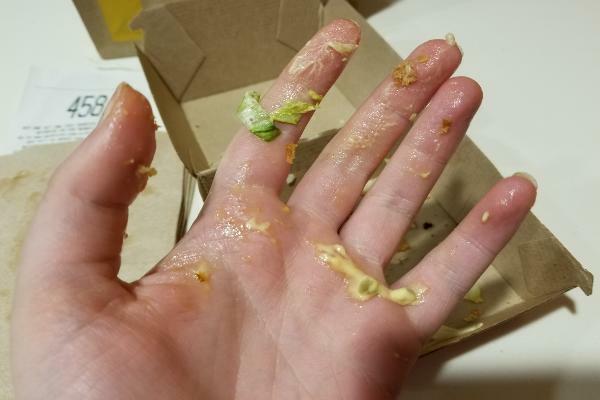 This was my hand after finishing the Big Mac. 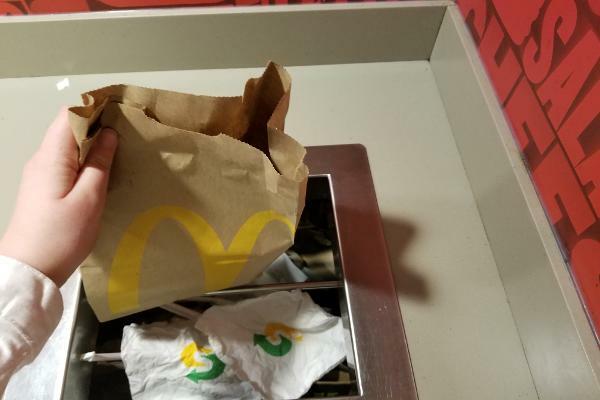 Should you find yourself at McDonald's for a business lunch or dinner date, it is probably not the best option to choose. As I walked back down the stairs, I watched as a man and his daughter carried a stroller down the steps from the second floor with a toddler insider. Apparently there was no elevator. So much for being kid friendly. I also noticed that the restaurant, unlike some others in the city, had only trash cans. That may be a turn off for environmentally conscious millennials. 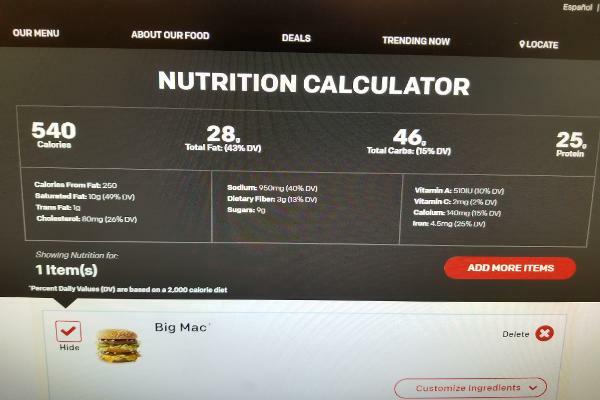 The experience of eating a Big Mac finally concludes with the realization that you have eaten more than a quarter of the recommended daily calories consumption. That, of course, does not include fries or a drink.